January 17, 2019 – The British gold Sovereign is one of the most popular and enduring coins around. It has been struck from 1817 to present, and well over 1.1 billion were struck over those two centuries. During those years, the coins were struck at numerous mints, including in Great Britain (London), Australia (Sydney, Melbourne and Perth), South Africa, Canada and India. Recently, NGC received a pair of coins that appear to be 1913 Sovereigns struck in London. Unfortunately, even though they were within tolerances on weight and metal purity, both were counterfeit. 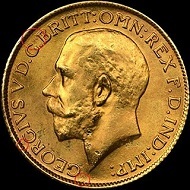 Counterfeit 1913 Great Britain Sovereign No. 1. In the photos above, there are numerous red circles. These highlight the areas of interest with regards to determining the authenticity of these pieces. The first anomaly is located between the “G” and “B” at 11 o’clock. It appears to be a patch of die rust that will appear on every coin struck from that obverse die. 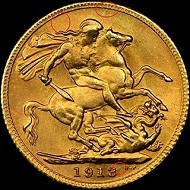 Considering that these were gold coins, the London Mint would not have put a coin with such a defect into circulation. Another patch of die rust can be seen above the second “G” in “GEORGIVS” on the obverse, as well as a third above St. George on the reverse. There are other, less severe areas that can be seen as well. Also of note (but not circled) is the extremely weak strike on the high points of the coin, most notably on St. George and the horse. 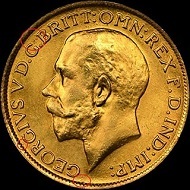 Counterfeit 1913 Great Britain Sovereign No. 2. As you can see, the second coin has the same defects as the first. This proves that the flaws are in the dies used to strike the coins. In addition to the areas of rust and weak strike issues, there are other imperfections evident. The date has a very odd raised area to the right of the “3,” which would not be something seen on a genuine example. Additionally, tool marks can be seen at 6 o’clock on the obverse and 12 o’clock on the reverse. These appear as small spikes emerging from beneath the denticles and are often seen on counterfeit coins. Sovereigns can be fun coins to collect. Many people try to obtain one from each mint, or even try to obtain entire runs of certain monarchs. However, there are many fakes present in the market. Many of those are actually gold, like these are, so that would limit the financial loss of the purchase of one, but it still a risk. NGC has created a comprehensive Counterfeit Detection resource to help collectors and dealers identify counterfeit and altered coins.